Spinning for a sea-run brown trout near the mouth of the Hokitika River. Almost all the West Coast rivers contain sea-run brown trout in their lower reaches. It is always worth having a few casts! 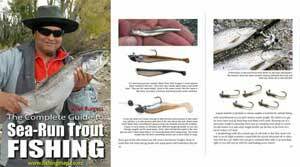 Fly fishing and spinning for trout – plus the chance of a salmon! Anglers trying their luck at Hokitika River trout fishing can expect sea-run brown trout in the lower river, though they are usually smaller fish than those found on the East Coast, mostly around three pounds, with occasional five-pound fish. Resident brown trout tend to occupy the middle part of this river. Upstream, particularly above the Hokitika Gorge, it is true wilderness fishing and some of the rainbows are quite big fish! Backcountry fishing for rainbow trout in the Hokitika River is quite challenging and requires a fair bit of walking. The visiting angler can expect a few Chinook salmon to be present in the Hokitika River from late December to April. 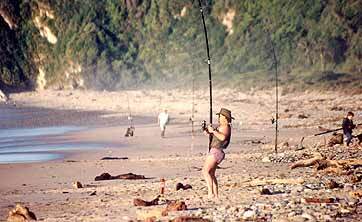 It is always worth casting for sea-run brown trout near the river mouth. There is very good access from both banks, especially below the highway bridge. Check out and download the very comprehensive West Coast Fish and Game access brochure. Overall the Hokitika River is 64 km long. It offers plenty of good fly fishing upstream. If you prefer the fly rod in the lower reaches for brown trout try a Parsons Glory or Yellow Rabbit. Upstream a Hare and Copper Nymph, Coch-y-Bondhu, or any brown beetle pattern is worth a try. If spin fishing when the river is low and very clear try a smaller spinner like a black and gold Glimmy, or a small blade spinner such as a Mepps with a black blade. 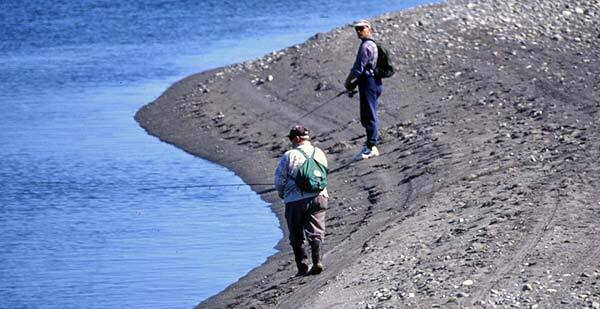 The lower river is wide in parts and well suited to spin fishing if you are seeking to cover plenty of holding water. Don’t even consider Hokitika River trout fishing without adequate protection from the dreaded West Coast sand flies. In some spots on this river, they can drive you crazy! The strange this is that frosty winter days don’t bother the sand flies at all. Again it is best to avoid the lower river during the whitebait season as it gets very crowded, particularly on the first push of the tide. If spin fishing the middle and lower river good lures to try are black and gold zed spinners and Tobys. If you are targeting the small runs of quinnat salmon try a small 22g silver zed spinner fished on 20 lb monofilament. The annual salmon run in the Hokitika River is estimated at 200-500 fish. More on West Coast Salmon Fishing Rivers. The surf beaches along this whole coast provide excellent surfcasting when sea and weather are favourable. Snapper can even be caught from the beach behind Hokitika township on occasion. You should also give Lake Kaniere a try if you have the time. It contains browns, rainbows and perch. It is quite difficult to get to most of the shoreline around this picturesque lake. A boat or kayak is a big asset on the West Coast lakes, and Lake Kaniere in particular, where the native bush often hangs right out over the water. If you enjoy spin fishing you will be pleased to know that there are no “Fly Fishing Only” waters in the West Coast Fish & Game Region at all. You’ll find current fishing regulations, water opening periods, and bag limits at the West Coast Fish & Game link also. Bait fishing is also permitted in all waters on the West Coast – as is the use of boats. In the Hokitika River, no licence holder shall take, kill or be in possession of more than 4 brown trout, 2 rainbow trout, 2 salmon. There is no daily bag limit for perch in the West Coast Fish & Game Region. Tackle Stores and Fishing Licence Agents in the West Coast Fish & Game Region. New Zealand MetService weather forecast for Hokitika. 252 Beachside Motels & Holiday Park, Hokitika.